Beautiful Sterling Silver Cuff Bracelet Created by Master Silversmiths Navajo Artists Artie Yellowhorse and Henry Chackee. Signed by the artists. 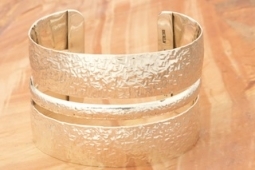 The bracelet is 80 grams of 925 Sterling Silver. Bracelet is size 6 3/4"